Their last new game was a simple, single payline, 3 + 1 reel slot machine, but WinADay.com has pulled out all the stops with the new game just launched at the three-dimensional online casino. The new Vegas Mania is a five-reel, 21 payline slot machine featuring all the bells and whistles that a true Vegas Maniac looks for. 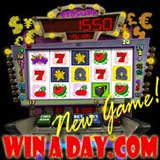 Check out this high stakes slot machine with a total maximum bet of $84 per spin at WinADay.com. Players get up to fifteen free spins. Wild symbols increase the chance of winning and Double Wilds increase chances of winning and double those winnings. And like all games at the innovative new casino operated by online casino pioneer, Slotland.com, the new Vegas Mania is tied to the WinADay.com progressive jackpot. Vegas Mania is a high stakes slot machine with a total maximum bet of $84 per spin. Players can win up to 3000 times the betted amount. "The last game we launched, Slot-O-Matic, was a very simple one and we were amazed by its instant popularity," said Ondrej Tuma of WinADay.com. "Nevertheless, we know that lots of our players like to play the more complex, more strategic slot machines. This is the most elaborate game we’ve ever designed. " WinADay.com had its second major jackpot winner recently when “Forgomo” won $200,111 on the Heavy Metal slot machine. The first jackpot was won not long after the new site launched. “Monica68” was playing the Wheeler Dealer when she won €116,200 ($148,724). Continually adding new games, WinADay.com now has seven slot machines and video poker games to choose from in its three dimensional Games Lobby. Animated casino staff are available in the Lobby to answer questions and direct players to their game. WinADay.com games are all instant-play, no-download Flash games. There’s nothing for players to download or install – they are in the 3D casino lobby, ready to play, in seconds. All games are original, built using proprietary software only available at WinADay.com and they’re all tied to one progressive jackpot pool.